We are a husband and wife team producing authentic Spanish Churros and Chocolate from our converted vintage horse box, we import our churros flour and our Hot Chocolate Valor Cao directly from Spain. As we make all our dough freshly onsite, continually throughout the day, we have kept our menu simple: Churros with Cinnamon Sugar and a Pot of Hot Chocolate Dipping Sauce. We also offer soft drinks. 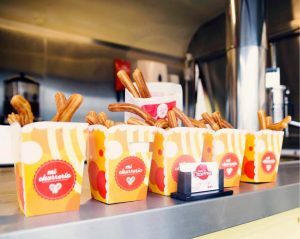 The method we use of manually piping the churros batter into our large fryer provides customers with a real show along with the delicious smells you experience from live cooking. We are proud to be in the British Street Food Award FINALS this September and extremely passionate about producing the best Churros in the UK.